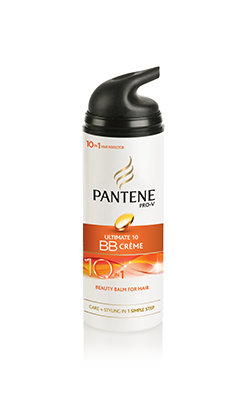 Repairs, strengthens, softens, shines, smoothes, moisturizes, protects, and detangles – these are just some of the ten benefits that Pantente Pro-V says their Ultimate 10 BB Crème will give to your hair. Although it says crème on the packaging, it’s not as thick as you might think. It has the texture of a very lightweight lotion. So if you have fine hair you can still use it, or at least on your ends. We felt like it definitely decreased hair breakage and detangled well, but if your hair is super dry you will need something more. Also, the best way to use this product is on damp hair, it may feel a little sticky if you use a lot of it on dry hair. Tip: If you like waves this is the perfect product! It has the perfect amount of water content so if you use it at night with a braid or bun, you’ll wake up with gorgeous waves. A perfect time saver for getting ready in the morning!